Try not to touch them. No rubbing or pulling at them. Do not allow them to get wet for at least 2 hours after treatment. Avoid steam or heat treatments for at least 24hrs after treatment. Do not use any oil based products around the eyes. This includes eye make up remover, mascara and face oils. To cleanse, use a cleansing cloth with oil-free eye make-up remover to wipe down the lashes. Avoid using cotton pads as fibres can get stuck to the lashes. Keep them tidy by brushing regularly with a clean mascara wand, provided by your lash technician. 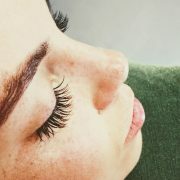 If you would like to apply mascara to your lashes, we also stock oil-free mascara. The extensions will fall out naturally with your natural lashes over the course of about 4 weeks. For maintenance, we recommend infills every 2-3weeks to fill in any gaps.